SHN Payback: Paul, I wanted to thank you so much for talking to us today at SHN Payback about the impact Khemosabi++++// continues to have in the breed. Even though he's been gone for a decade now, his get and grandget continue to shine, especially in the Sport Horse Division. Last summer, when Modern Arabian Horse declared Khemosabi++++// the #1 Top Dressage Producing Sire of 1960-2010, were you surprised? Paul Husband: Yes. Very pleased to read it, but I did not know. Very proud of the Khids. SHNP: To have 45 champions in dressage would be an amazing accomplishment for a horse in any breed, but for an Arabian who passed away just as the sport of dressage was gaining a foothold in the breed, it's just phenomenal. That same summer Khemosabi++++// was honored by Arabian Horse World as the All Time Leading Sire of Working Western Horses. What is it that he passes on to his kids and grandkids that allows them to be so versatile and to succeed where ever their owners point them? PH: It was a thrill to see that statistic. 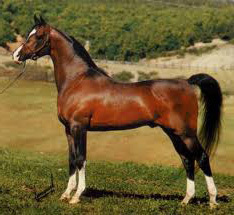 I think that Khemo passed along a combination of good disposition, that the Khemo horses seem to have, plus he tended to sire horses with strong loins and hindquarters, so they can turn, or collect. Plus, I think that he passed on the traits of balance, a nice shoulder, and a short back. SHNP: I heard that you're interested in Arabian Racing, and will be emceeing at the 2011 Darley Awards. The SHN Payback Program has the great Polish racehorse, *Gorec as a nominated sire. For small breeders, do you think choosing sires that can win in the Sport Horse Division, take top endurance honors, and possibly cross over to the track is important? PH: Well, I think that each breeder should examine himself or herself and decide what type of horse that he or she wants to breed. But I do think that breeding horses that can have multiple alternative uses is a good idea. *Gorec was a tremendous racehorse. He won the Polish Derby, and thereafter twice won the Europa Cup Stakes, going 2,600 meters. His sire, Druid, was also a superior racehorse. So, he has got the record and breeding to be a successful racing sire, but his desirable attributes do not stop with his speed -- he is also well conformed. Gorec is of the Amurath sire line, through Nabeg and Wojslaw. Quite a number of very well conformed and athletic (and fast) horses have come through that sireline. 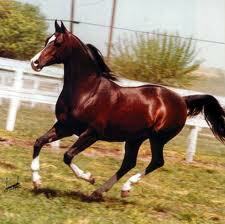 *Emanor is another example of a superbly conformed and athletic son of Wojslaw. 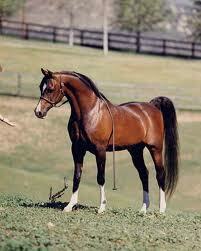 *El Nabila B is also of that sireline through Nabeg and Menes. It makes a lot of sense to nominate a stallion like *Gorec for the SHN Payback program. Such a nomination builds value into his offspring that may be athletic, but who do not excel at the track. It makes market sense and breeding sense to nominate a successful racehorse like *Gorec to the SHN Payback Program. SHNP: If the Sport Horse Division had existed when Khemosabi++++// was alive, do you think he might have competed in it? PH: I think so. I am pretty sure that he would have. I think that he would have been a Show Hack. Maybe he could have done other things too. He was a nice moving, sort of "all around" horse. He would have also competed in driving. He did compete in harness when he was young with Mo Morris driving. SHNP: Now, if I wanted to go directly to the source, I understand there are a limited number of "Khemosickles" available. How could I find out more? SHNP: If he were alive today, do you think the Khemosabi++++// Syndicate would consider participating in a program like SHN Payback? PH: Absolutely. We would have been in it for sure! SHNP: What do you see in the future for Khemosabi's "Khids?" 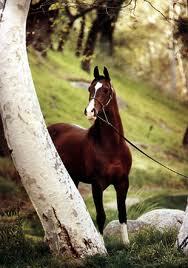 PH: Hopefully, continuing a line of good honest horses who are great friends and useful. SHNP: Is there anything else you'd like to share? TRUTH, JUSTICE and THE ARABIAN WAY!!!!!! I have heard a rumor that a new membership program will be announced shortly for anyone who would like to be a member of Khemosabi’s Posthumous Preposterous Patriotic Band. (no, I am not sure what kind of music they play -- probably old school R & B – or maybe The William Tel Overture). I blog from time to time at http://HorseDollars.com I would welcome readers. SHNP: It's been a pleasure talking with you today. Thank you for taking the time to discuss with us the impact Khemosabi++++// and his offspring have had in the Sport Horse Division. We at the SHN Payback Program look forward to watching that trend flourish as mare owners continue to choose Khemosabi-related sires to create their future winners.